Ben Conrad is sleeping when his sleep is interrupted by an intruder. He looks for his gun, but falters, realizing that the intruder is Kid Scout, come to tell him of the actions of the Hollow Men in Heroville. The next page: The final page of The Hollow Men, where The Hollow Men succeed in finally making the world colorless, ending the world in satisfaction. In Heroville, The Hollow Men supervise a great burning. As they do, Conrad arrives. He is aghast. Superman plows through the fire, streaking into the sky. Superman ponders how it felt to lose hope, and he is disturbed. Conrad, meanwhile, starts typing an alternative story, using his power to try and end The Hollow Men. He creates a final adversary, bringing Superman into the picture. Superman lands, and tells The Hollow Men to do their worst. He has decided that they cannot destroy his will. They run away. Superman meets Kid Scout, who tells him about Conrad working to fix the problem. He asks if he will get to see Superman beat up the bad guy. Superman tells him that he is a pacifist, then takes off to fight The Hollow Men. They converge their power on the Man of Steel, and he begins to lose all hope. Still, he fights. He begins to have strange visions of an aesthetic farm where he is the patriarch and Lois is the loving wife, asking him to heat up some food with his heat vision. "What's the point?" He asks. Lois appears in front of images of failure, a nurse to the evil Doctor Luthor, the man who inspires all of the children of the United States! Clark begins to see through the madness through Lois, and she leans in to kiss him, breaking the lethargy. The heroes affected by The Hollow Men re-pigment, and The Hollow Men dissipate, mostly. 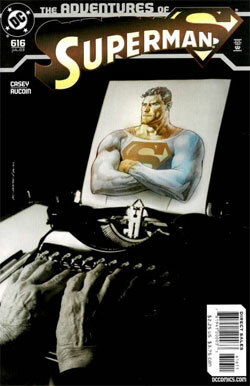 Superman turns to see Ben Conrad writing the ending, and The Hollow Men explode. Amidst thoughts of Lois and love, hope coming back, Superman leaves for home, contented. Story - 1: Doesn't it make sense that if the writing came true, the world would have ended? I mean, this is the last line of the story. This is the way the world ended. Ah, well. I guess it was metaphorical. But then, a colorless world is its end to me, and seemingly, if what happened in the book began to transpire, as is implied by the defeat of The Hollow Men, then wouldn't the world be colorless? I don't understand, fully. Perhaps I am not supposed to. But I wanted to...that's important. Why did they run away, only to just face him again? As an excuse for dialogue? To kill two pages? I don't understand at all. But I wanted to. What infuriated me the most with this story is the fact that Superman claims that he is a pacifist, then goes off to deal with the problem using power. I think we can all agree that while Superman fights for peace, he is in no way a pacifist. He uses fists to solve things, because he HAS to. It's not fun, it's not nice, but it's needed. Most importantly, it's not pacifistic. Remember that thing he spearheaded, what, two years ago, called Our Worlds At WAAAAAAR!? Well, I guess he can be a pacifist and go to war. That means I can eat meat and be a vegetarian. WOO HOO! Why the heck is being a farmer on a black and white farm going to make Clark lose hope? What kind of thrown in nonsense is this? How many times do we have to use Lois as a catalyst for Superman just magically breaking free of a situation before the writers understand it was old when it was SPIDER-MAN's device? Must...get...out...from under...impossibly huge...pile...of rubble...for May...for Mary Jane! Fifteen years ago, now. It's old. "The Hollow Men decide that they were wrong and disappear magically, for no reason, from existence. The writer of The Hollow Men is rich and beautiful and has a supermodel for each day of the week in his new Lexus at his mountain home, where he is about to be magically transported, complete with a new computer and a chicken vindilu dinner." Not build up a large, potentially failing story while Superman is dying. Or maybe, it wasn't clear, maybe Superman was sent in by Conrad, send in Superman to potentially die and then just save him for dramatic effect. The point being, this story really didn't have much lasting effect, many interesting and/or plausible characters, and it lacked any fun or continuity. I mean it kind of influences what's going on with Zod, right, but then, it's out of sequence even in that story, and there are enough plot holes to make even the most forgiving fan blanch. "This is quite possibly the most terrible, pointless Superman story I have ever had the displeasure of encountering. To give you a conception: I enjoyed the Millennium Giants with Superman Red and Blue a heck of a lot more, and I hated that series with a passion." I felt terrible after writing that. I really did. I said to myself, this is unfair. It's his first issue, and DeMatteiss wasn't really going anywhere, maybe he was trying to cover for a bad plot he didn't start. But the problem with that series is the same problem that plagued this one. Long, boring, pointless, and terrible. This is not the worst Superman story I have ever read. It is the second worst. Adventures of Superman #588 takes the cake. But, it is of note, both were written by Casey. It is hard, working for a site that loves Superman and being a writer who, himself, loves Superman, to take such a stance against a writer. But I really felt like these flat stories detract from Superman and fans. Sometimes Superman shines in the comics these days, but not for stories that make no sense and take no risks. This storyline is one. Oh, Superman is having his will sapped? Well that's never happened. It's called the PARASITE. And he may not sap hope, sure, but if Superman beats the sapping of his will by, say, HIS WILL, that doesn't make much sense as an idea for a new villain now, does it? Especially since they offer no further threat and just disappear. Conrad might as well have written "Nothing that I caused that I didn't want caused happened." Then we would be saved these issues. Conrad is empty, foolish, and unpunished. I want more from Superman comics. I really do. This comic exemplifies the worst of things right now for me. Remember Ultraman? Satanus? I barely can, and I don't want to any more. If this comic doesn't get much better, I fear the way of Man of Steel. Art - 2: The art certainly conveys the story, but it is very dark and angry looking. Superman is an idealist and a bright, shiny hero. That way, if Hollow Men attack him, he looks more than agonized when his color leaves and his hope goes away, he looks positively wrong. Here it just looks like he's a bit upset. Lex looks about as sinister as Superman does. Cover Art - 4: I actually liked this one. It makes sense, given the content of the story, it's interesting to have actually human hands on the page, and it begs the interesting question the story never did. How does it feel to write something that means so much? I'd like to know, myself, so the cover strikes a chord. The logo stinks, as per usual. SUPERMANS. But I love old typewriters. No background. Bad logo. Minus one. But still, it was neat.